Question Time in the house. Posted on February 25, 2012 by Brendan Jones Posted in Leading, teacherstuff	. 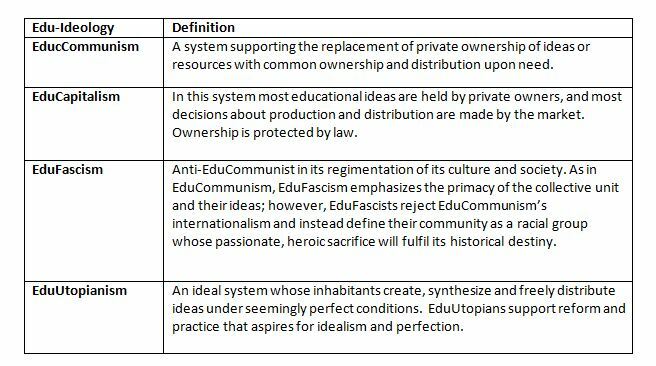 As politics appears to be the flavour of the month in Australia, my thoughts recently drifted to musing on the existence of edupolitical ideologies. I thought – why not? Seeing as how an increasing amount of educational talk and thought is framed is non-educational terms (business has clients and stakeholders – now so do we; education and schools get an annual checkup – just like the one’s doctors give) I wondered how well political ideologies and education would mesh. Not just (INSERT LOCAL POLITICAL PARTIES HERE), but foundation political ideologies, like the ones at the start of this post. 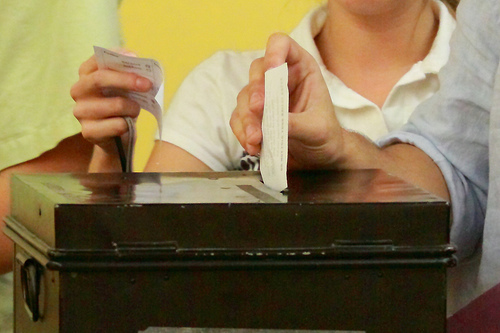 In order to make this a relatively painless, quick and hopefully coherent exercise, I think it’s wise to observe some boundaries – for instance, covering every political persuasion is an impossible task. And narrowing the scope of the comparison to one issue that has generated some discussion lately – namely the ownership and sharing of ideas – seems prudent. If I avoid allegorical clumsiness and the mesh is valid, then others may see additional ways to apply the notion and may want to further the story themselves. At the start of this post, I’ve supplied the four definitions as a stimulus of sorts, and they will be the foundations of my thoughts. Everyone has heard of them (probably with varying degrees of interpretation) but I’m hoping that these generic statements will suffice. The suggestion that there are edupolitical ideologies might seem ridiculous and a waste of time to some, but I think it’s got plenty to do with how teachers collect, use, remix and then propagate their ideas and resources. It has to do with your views on copyright, ownership and freedom of knowledge. It has roots in your social awareness and personal upbringing, and in your circumstances past and present. It could also be a product of the recent influence of others – the faceless men in your spheres of influence that shape your thinking. The obvious question first – as an edupolitical ideologist, where do your allegiances lay? Is it cut and dried, or more shaded and qualified? Having said that, just like political parties, there are various factions and shades that blend these distinct groups into smaller parties and belief groups. As there should be. Subscribing to one philosophy holus bolus probably isn’t wise. Tags: ideas, ideology, sharing	.